CRUST is a full-service retail and wholesale baking company located in downtown Fenton, Michigan. The bakery at 104 W. Caroline St. stretches for nearly a block and is easily identified by its bright yellow awnings. Large glass windows look in on the busy kitchens and showcase the classically trained bakers at work alongside an impressive bread oven from Verona, Italy. While most of the building is dedicated to production, a small retail space is modeled after bakeries the owners visited in Montreal, Toronto and New York. The warehouse-styled space features a chandelier of interlocking glass Cs created by a local artist along with re-purposed seating and display pieces collected from area antique and consignment shops. Most commercial baking facilities would shy away from a production facility with so few walls, since this is where most bakeries place equipment – ovens, proofers, refrigeration units and the like. It would have been much easier and less costly to build a new facility to our specifications. But we wanted to re-purpose and revitalize a building in this community’s downtown, just as we wanted to revitalize and preserve the traditional artisan methods of baking from scratch. CRUST is owned by the same family that opened The Laundry, a popular dining destination in downtown Fenton since 1997. Their bakery concept had been simmering since early 2009 and when offered the opportunity to revitalize another downtown property, the group embraced it and spent the next 13 months reworking the space on W. Caroline. CRUST opened in February 1, 2012. CRUST is dedicated to excellence in artisan principles, with all-natural ingredients that are locally sourced and organic whenever possible. The flours we use in our products are all unbleached and unbromated, and we partner with suppliers who source their wheat from non-GMO sources. CRUST produces over 120 different baked goods, and all are handcrafted using traditional baking methods. Their artisan breads were recently voted Mid-Michigan’s Best Bread, while their donuts were also ranked among the best in the state in a people’s choice vote in early 2014. Other sweet selections include: Viennoiserie pastries, cookies, muffins, scones, decorated event cakes and fruit pies. A popular lunch menu features made-to-order sandwiches, rustic pizzas, salads and soup. The bakery opens daily at 7 a.m. For more information, call the bakery, 810-629-8882, follow us on Facebook, or visit our website, www.crustandbeyond.com. 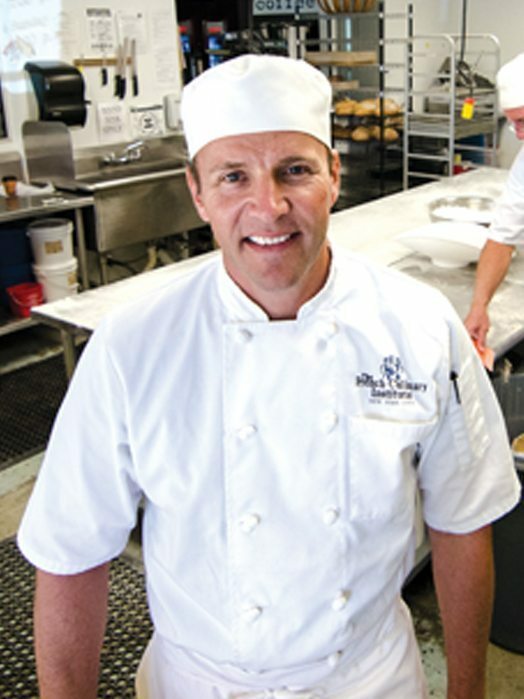 Mike Green is head baker and co-owner of CRUST. After a successful 14-year career launching new product lines with Ford Motor Company, Green decided to pursue a life-long interest in baking fostered by his grandmother. He attended the French Culinary Institute in Manhattan and also holds a Masters in Science from Rensselaer Polytechnic Institute in New York. Green helped open CRUST – a baking company in February 2012. He lives in Fenton with his three children and husband, Mark Hamel. Chad Brennan is one of the co-owners of CRUST – a baking company. Similar to Mike, he worked 14 years in the supplier arena of the auto industry with a focus of recruiting and sales. In 2009, he invested in The Laundry becoming a co-owner and partner. In 2012, Chad and his wife, Marybeth, joined Mike and Mark in the creation and development of CRUST. Chad has actively served as the Sales Lead in growing the wholesale side of the bakery. He lives in Linden with his wife and his two sons, Dylan and Owen. Amanda is the Office Manager for CRUST and has been with the bakery since 2016. She has a Bachelor’s degree from Eastern Michigan University with a double major in Marketing and Communications. She has lived in the Fenton area her whole life, and attended Linden schools. CRUST is one of only twelve Michigan members of The Bread Bakers Guild of America, a non-profit alliance of professional bakers, farmers, millers, suppliers, educators, students, home bakers, technical experts, and bakery owners and managers who work together to support the principles and practices of producing the highest quality baked goods. The Guild was formed in 1993 to shape the skills and knowledge of the artisan baking community through education. CRUST often opens its doors to the community for full-access tours, tastings, open houses and hands-on baking classes (fee charged for classes), but we also participate in a multitude of activities and events beyond the walls of the bakery. It is an important part of CRUST’s mission to give back to the communities in which we operate, and we take our stewardship of this community very seriously. Family-owned businesses like CRUST can help sustain smaller communities like Fenton, which is why we’ve committed to active roles in foundational organizations like the local Chamber of Commerce, Fenton Community Center, Fenton Rotary, the Downtown Development Authority and local arts council.